As part of my latest commission, I've got two Space Marine forces to paint up. 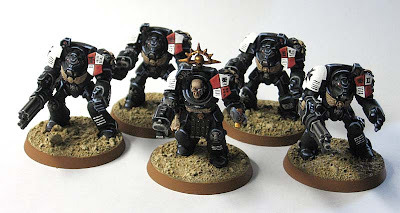 Part of them are Black Templar and part are a DIY Chapter, Immortal Host. I am very fortunate to have worked with this client before and we've got a great working relationship. With the ideas he has and the creative freedom I'm given, we're able to come up with some really nice looking models. This unit took a day to finish but they still need some static grass on their bases after they get varnished. Awesome! That's a really scary squad with two assault cannons. I wasn't aware the BT codex allowed that. I'm sure this will get changed when the new Codex comes out in the future. I think BT's are the only ones left who can double up on the heavy weapons like this. Great stuff, I like the detail on the coat of arms on the shoulder pads, makes a nice unifying look for the unit! Thanks Pacific, I'm working on more Templars tonight.